Clint Choate (left) and Brett Price (right) debuted SnapAV and Clare's new Clare One security and automation system at ISC West 2019 this week. 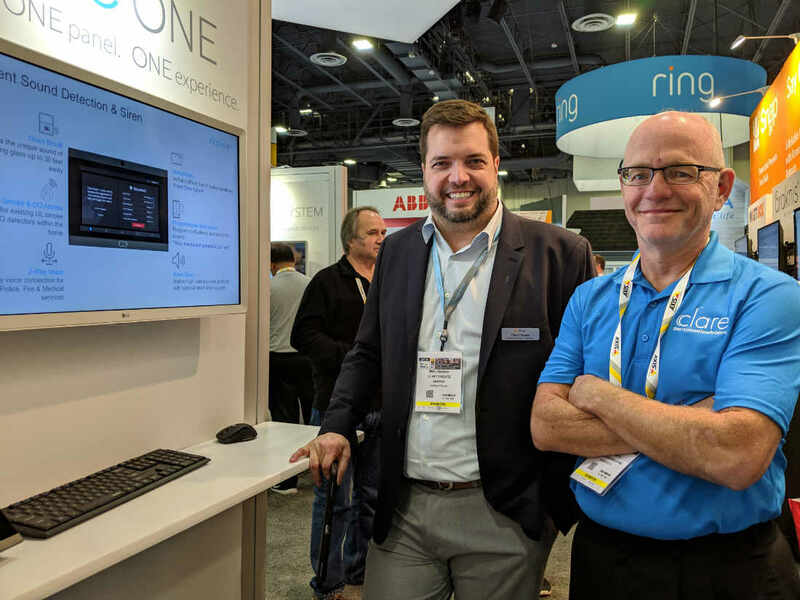 Introduced at ISC West 2019 this week, the new Clare One security and smart-home system from SnapAV looks and feels like other self-contained panels from Qolsys, 2Gig, Honeywell, and the others. The price and specs are similar. The alarm monitoring and SHaaS (smart home as a service, through Alula) are similar. But the product is so new in so many ways. For starters, it will integrate with popular third-party home-automation systems like Control4, Crestron and Savant when it launches later (much later) this year. (Elan too? Elan is the only controller that currently integrates with Clare One competitor 2Gig). Importantly, the panel will incorporate SnapAV’s OvrC platform for remote monitoring and management, joining a growing ecosystem that includes networking, A/V, surveillance, Z-Wave automation, power management and other connected gear. Clint Choate, SnapAV market director for the security channel, is a little bit excited about this initiative. He tells me he begged SnapAV (relentlessly) for permission to show the prototype at ISC, even though it won’t be shipping within the next three months. Clare One comes from SnapAV’s recently announced partnership with Clare Controls (home automation) and Alula (alarm/automation systems and SHaaS). Alula currently does not offer a self-contained touchscreen-enabled panel a la 2Gig and the others, preferring to keep all the system intelligence in a hub and the user interfaces where they matter. Like the Alula hub, Clare One will include Z-Wave, Wi-Fi, Bluetooth and 433 MHz radios, as well as cellular for alarm communications (dual-band IP/cell). It will include all the requisite features for UL listing, including 24-hour back-up battery. It has a 7-inch touchscreen with a 5MP camera that captures the user who disarms or alters the system. There’s an onboard siren, two-way voice service, voice annunciator, Amazon Alexa support, 12 selectable chime tones, and audio analytics for detecting the sounds of breaking glass and smoke/CO alarms. The specs and features are pretty much the same as the Qolsys IQ Panel 2, except for support of DSC’s PowerG 319 MHz sensors. But it’s coming from SnapAV, leading supplier for the home-technology channel. As such, it will reach thousands of dealers that aren’t already installing alarm systems, and the channel can bet that SnapAV will have the integrator’s business in mind. At the same time, SnapAV plans to “bring home A/V to security dealers,” Choate says. Related: SnapAV’s Distributor Acquisitions: The Amazon of Home Tech Channel? Currently, Nortek’s Elan Home Systems, with sister security brand 2Gig, is really the only competitor that can so effectively drag alarm dealers into the A/V fold. Clare One will enable a similar degree of integration (business- and technology-wise) when it comes to security, surveillance (with a high level of video analytics and NVR engine), audio/video and back-end services and support. Elan doesn’t have OvrC, but it is launching a dealer portal and OvrC-like engine that I deemed the winner of ISE 2019. While Clare One won’t ship until later in 2019, SnapAV is laying the ground work through its work with Clare and Alula. In addition, Clare and NorthStar recently announced a partnership that brings NorthStar’s affiliate program to all Clare security dealers, meaning dealers get security funding options for Clare’s secure hub and all Clare encrypted intrusion sensors. Click here to see more Clare One images and details!